Most common diet plans leave you hungry for more and work on the principle of starving your body. We don’t believe in crash diets but instead a healthy food plan that leads to a healthy lifestyle. That’s why we’ve designed The 7 Day No Hunger Diet. A food plan that can be sustained for the long term and won’t leave you hungry. We’ve packed each of the meals with high protein and fiber. Protein is fantastic for cutting craving because it slows the absorption of sugar in your blood stream. Protein can be found in lots of meat, eggs and nuts. A study in America found that those people who eat high protein meals shed 20% more weight than those who are on a high carb eating plan. The most important part is that you are shedding FAT not muscle. Having bigger muscles means you burn more weight off. Fiber is also fantastic for weight loss. Another recent study in America found that people who were at normal weight ate 34% more fruit than those who were overweight. Fruit, vegetables and wholegrain are great providers of fiber. The 7 Day No Hunger Diet consists of 1,300 calories a day. You can eat three square meals a day and two snacks. All these recipes can be made easily and quickly. There’s some fun new recipes as well. Breakfast: Oatmeal Porridge w/ Apple And Honey – Try a bowl of oatmeal porridge with fat free milk (semi skimmed if you prefer) Chop up an apple and top it with a spoonful of honey. Lunch: Middle Eastern Turkey Sandwich – Try two slices of turkey on two whole-wheat bread with a spoonful of hummus. Have some fruit on the side (try an orange, grapes, a pear or anything else) with a glass of semi-skimmed milk. If you’d rather have water you can add a treat to the meal like 6 spoonfuls of low fat yoghurt. 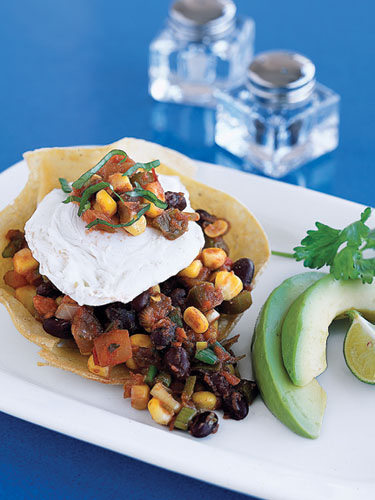 Dinner: Huevos Rancheros And Fruity Salad – Try mixing two sides of greens (anything you’d like) with a diced orange. 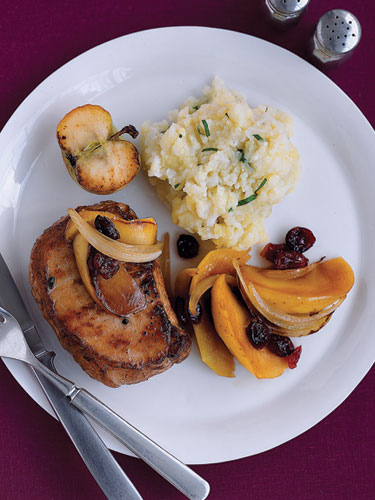 Top it off with two tea spoons of balsamic vinegar, one teaspoon of orange juice, and 1 teaspoon of olive oil. Snacks: Try half a cantaloupe, with three quarters cheddar cheese and three fat free crackers. Breakfast: Wild Berries And Nuts – Combine four tablespoons of yoghurt with wild berries (any kind) and almonds, cashews or walnuts. Lunch: Pear-Chicken Salad – Four ounces of cooked skinless chicken and mix it with four cups of mixed greens. Cook it and add a diced pear with a diced celery stick. Add a table spoon of fat free yoghurt with one tea spoon of honey mustard. Add some ground ginger and a tablespoon of mayonnaise. For the side try a semi-skimmed string cheese. 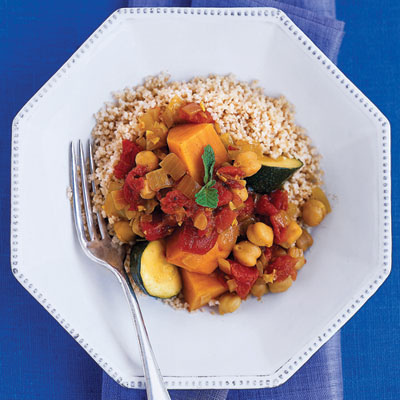 Dinner: Moroccan Sweet Potato Stew And A Citric Salad – Mix up three cups of vegetables with a diced orange. Add a quarter sliced red onion and six wedges of tomato. For dressing add a tablespoon of balsamic oil and olive oil. 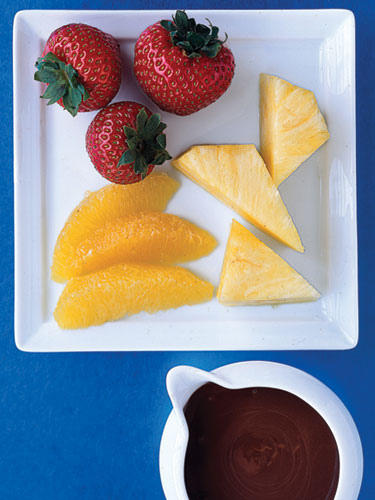 Snacks: Any fruit you’d like (we recommend a pear) and a cup of coffee, fat free without whip cream. Breakfast: American Classic Combo – Try two poached eggs and two sliced turkey bacon with one slice of wholegrain bread and a teaspoon of butter or light mayonnaise. Lunch: Open-faced Smoked Salmon Sandwich and one bowl of tomato soup six tablespoons of light fat free yogurt. On top add sliced and diced strawberries for that fruity finish. 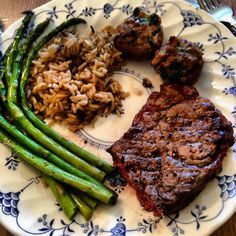 Dinner: Grilled Steak With Roasted Asparagus And Cranberry Rice – Grill a five ounce beef tenderloin steak. The best would be a Filet Mignon. For your side cook a quarter cup of brown rice and add a tablespoon of dried cranberries. Spray ten spears of asparagus with olive oil and roast or grill until crispy tender. YUM! Snack: Try one bag of low sugar/salt popcorn as a treat. Also take in a film. Breakfast: Wholegrain Cereal Mixed With Bananas & Berries – Wholegrain cereal with skim-milk. Add a diced banana and half a cup of blueberries. Lunch: Spicy Lentil Soup With A Walnut Spinach Salad – Mix half a can of lentil soup and half a can of diced tomatoes. Add one teaspoon of lemon juice with a small teaspoon of hot sauce with a sprinkle of ground cumin. Cook the soup until it is heated fully (simmer) Add crumbled Parmesan or mild cheese. Mix in two cups of baby spinach leaves with roasted walnuts, toasted, and ten diced grapes. For the finishing touch add a tablespoon of balsamic vinegar and olive oil. Dinner: Pan-Roasted Pork With Apple Chutney And Pepper Relish with eight strawberries. Snacks: Try one tablespoon of peanut butter on celery stick with a tablespoon of fat free yoghurt. Breakfast: Cheddar Cheese Melt – Start with two slices of wholegrain bread and top it with low-fat cheddar. Stick it in the oven until the cheese is golden brown. Add a splash of balsamic oil or vinegar oil to give it a tasty crunch. Mix up a cup of diced fruit for afterwards. 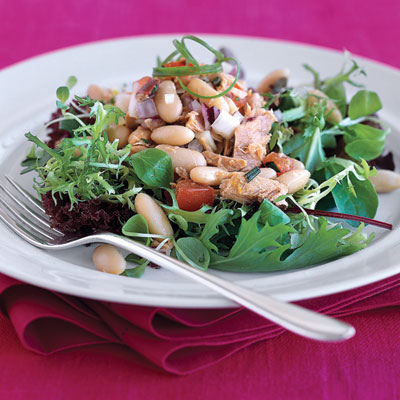 Lunch: Italian Tuna & White Bean Salad, On the side try a stick of semi-skimmed cheese string with a bowl of diced grapes. Dinner: Chicken Special BBQ – Get a five ounce boneless chicken and brush it thoroughly with BBQ sauce, stick it in the grill. Make some Coleslaw with a quarter cup coleslaw with light mayonnaise and half a tablespoon of vinegar. Add add half a teaspoon of sugar and salt and pepper the mix for taste. Your side dish should be a handful of pineapple chunks with baked beans. Snacks: This ones special, curl up with hot cocoa, twelve marshmallows with semi-skimmed milk. Breakfast: Smoothie With Strawberries & Bananas – Grab a blender, mix in half a cup of semi-skimmed milk and six ounces of fat free yoghurt. Chop and dice half a banana with half a cup of sliced strawberries and some vanilla extract. Finally add some six ice cubes. Lunch:Chef’s Savory Salad – Mix a chopped hard boiled egg with four cups of baby spinach. Chop up two slices of turkey, five mushrooms and add three slices of red onion. Add on top a quarter cup of crumbled feta or mild cheese. Drizzle on top half a tablespoon of balsamic vinegar and olive oil. Dinner: Cod Fra Diavolo & Greek Salad – To start mix a cup of green veggies with a quarter cucumber stick, thinly sliced. Add one diced red onion and three handfuls of diced olives. Drizzel a teaspoon of balsamic vinegar and two teaspoons of olive oil. Snack: Gran a large red pepper, slice in the middle and add three tablespoon of hummus. Breakfast: Banana with Peanut Butter Crunch – Start with one slice of wholegrain bread and spread a tablespoon of peanut butter and add half a sliced banana. Drizzle a teaspoon of honey over the top and drink a cup of semi-skimmed milk. Lunch: Healthy Ham And Cheese Sandwich – Start with two slices of wholegrain bread, spread mustard over the top. Layer over lean ham and add three quarters of mixed cheddar or mild cheese, with a few slices of tomato with baby spinach leaves. After the meal have an apple. 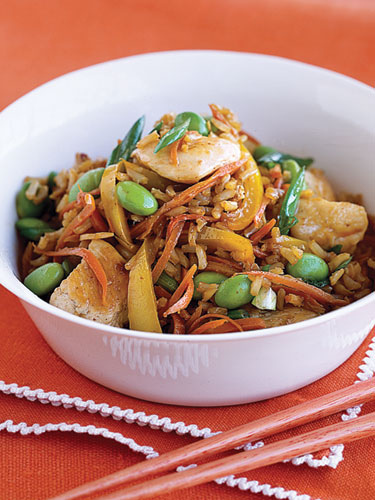 Dinner: Chicken & Veggie Stir-fry also add one cup of fresh pineapple chunks, sprinkled with a handful of silver almonds. 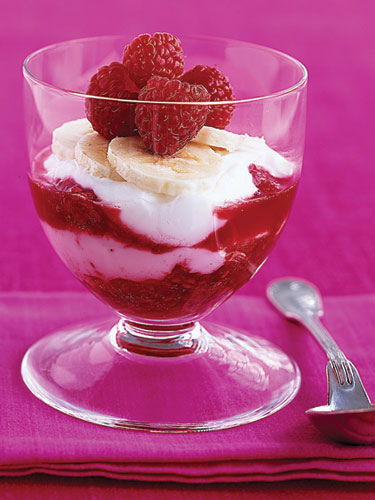 Snacks: Try six ounces of low fat yoghurt and a glass or red or white wine. Let Us Know How Your Healthy Diet Is Working For YOU! For more information on Muscles and workout or Supplements an nutrition.